Martineau and Oliemans Photo credit Da Ping Luo. 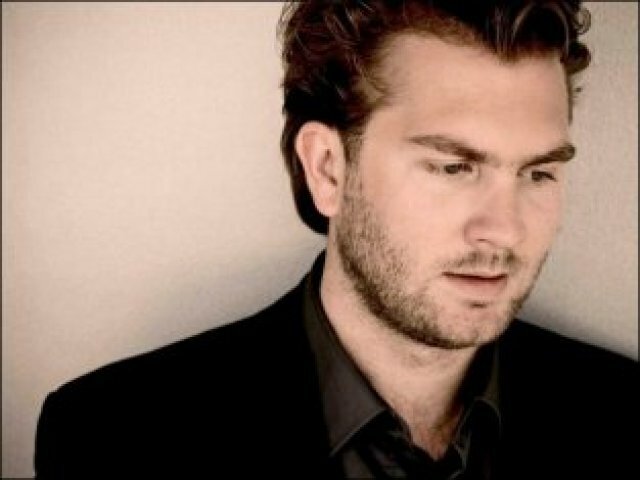 Magnificent baritone, Thomas Oliemans Photo credit Da Ping Luo. 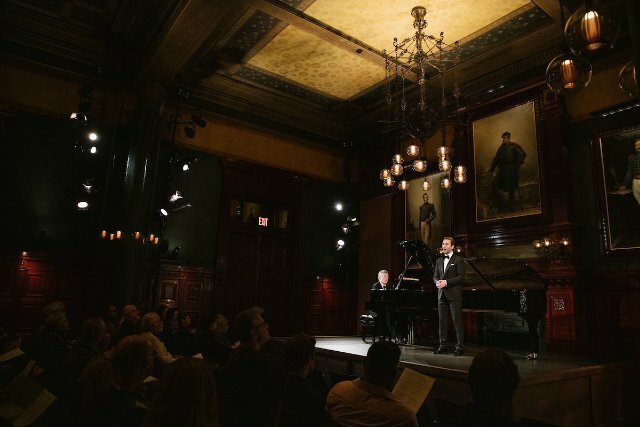 Honoring DuParc and Mahler at the Park Avenue Armory Photo credit Da Ping Luo. 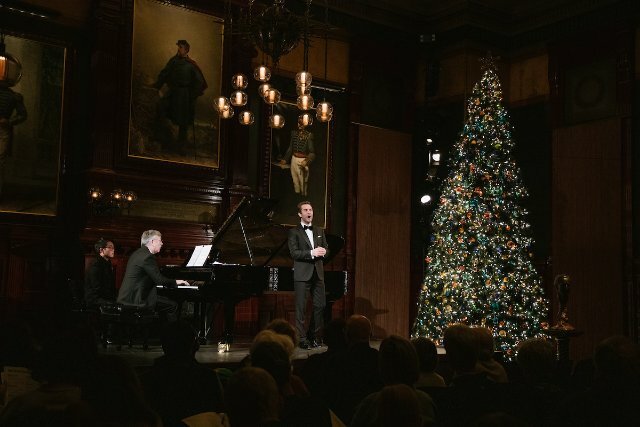 An exuberant, inviting singer, Thomas Oliemans Photo credit Da Ping Luo. Amidst the lights, gloirous sounds Photo credit Da Ping Luo. 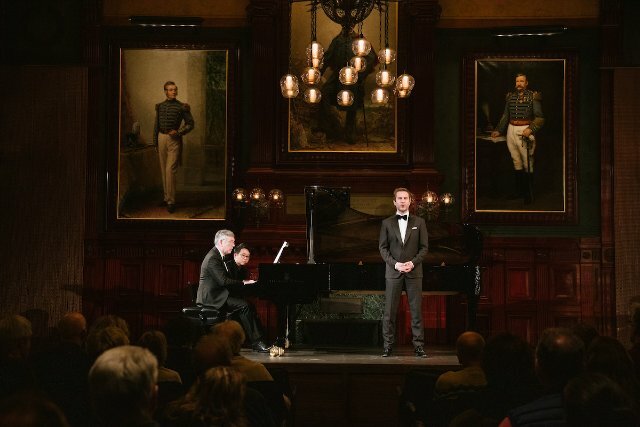 Thomas Oliemans, a Dutch baritone, sang in the Officer's Room at the Thompson Arts Center, Park Avenue Armory. His first line evokes love's bite, suggesting a mix of pleasure and pain that would inform his program. 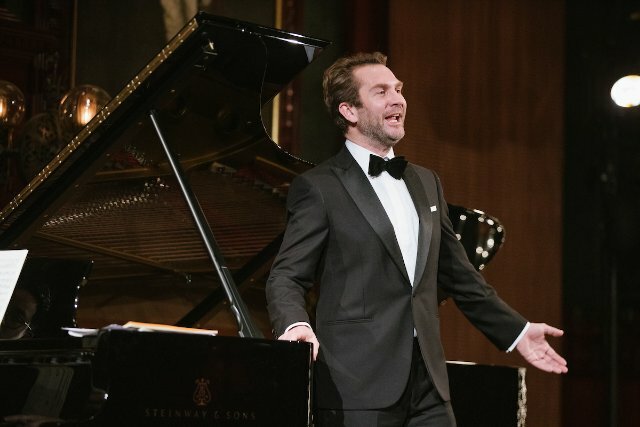 The tal, full-voiced baritone was accompanied by Malcolm Martineau whose delight in the songs of Henri DuParc and Gustav Mahler was apparent. At the end of one song he lingered on a single note, delaying its sound and then pouncing on it. The audience laughed aloud. This may have been prompted by a sense of relief after many intense and beautiful phrases, one following another. DuParc and Mahler are an unusual mix and ear-catching. 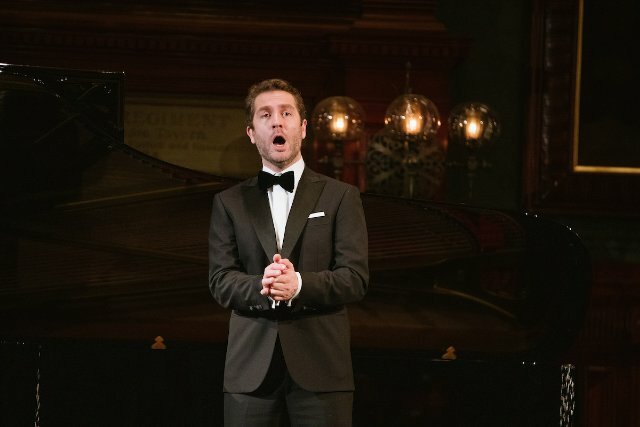 At first Oliemans explored the sounds of his voice in the room, which is so much smaller than the opera houses where he performs in Peter Grimes and Hansel and Gretel. Yet his voice sits well in the beautiful Officer's Room of the Armory. Sometimes the resonance of the room's walls was tested. At others, Oliemans murmured phrases stood out in the quiet space. His big voice comes from the rectangle formed by his hips and shoulders. It is not a chest voice, but rather a human chamber from which sounds seamlessly float. Big beautiful notes emerge from the lower register. In sections which suggest sprechstimme, that cross between word and note for which Humperdinck is famous, Oliemans both bites into the word and gives a tinge of tone. He always conveys drama and the emotion of the moment. A student of Dietrich Fischer-Dieskau among others he has well-learned the lesson of complete commitment to a song. Perhaps this is why Fischer-Dieskau (extremely selective) took him on as a student. Both singers capture story-telling in color and tone. At the top of his voice, Oliemans does not leave that rectangle, but he sits on it with lovely tones, whispered. A master of diction, particularly in German, the singer makes each word clear, even when it is hushed. We always understand words, shaped by both gutterals and vowels. Clearly Oliemans understands the comedy and humor which also delight Martineau. It is all the richer because it contrasts with the deep feeling of passages often describing unrequited love and death. 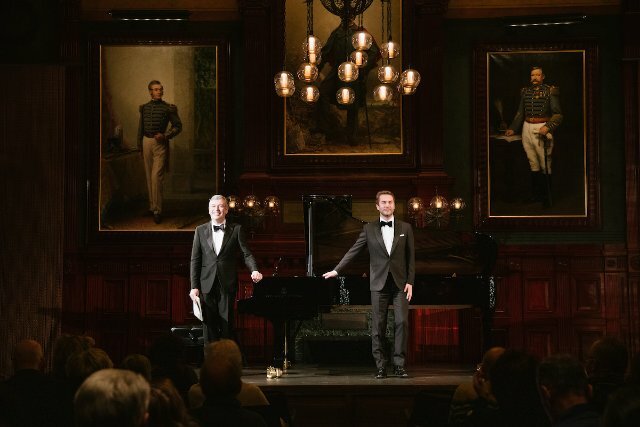 Former artistic directors of the Lyric Opera of Chicago and the Metropolitan Opera were in the audiences. Let us hope that they are paving the way to Oliemans' appearance on the opera stages of this country.